Architect and East Village Association planning co-chair Scott Rappe was an early advocate of a community vision for Division & Ashland. In this article for the Wicker Park blog Our Urban Times, Rappe traces past and current development plans at the East Village gateway intersection. After five years of uncertainty and concern, an empty lot at the southwest corner of the Polish Triangle finally may be getting the respect it deserves. Still called the Pizza Hut site, this corner had been the focus of community concern for decades. At a zoning hearing in the 1980s, members of the nascent East Village Association were told that they were lucky to be getting any development in that neighborhood. Despite vocal community protest, a zoning change allowed construction of the chain restaurant. While its closing in 2007 was welcomed, years of apprehension followed over what would replace Pizza Hut. Soon after the restaurant was shuttered, a coalition of community organizations led by EVA set forth four policies for redevelopment of the property. They called for a building that was significant, mixed use, high density and transit oriented. These values reflect the unique character of the intersection of Division, Milwaukee and Ashland, commonly referred to as the Polish Triangle. Historically the center of the Polish community in Chicago, the Triangle now serves the surrounding community as a major public transit hub served by three bus lines, a bicycle meetup location, a cab stand and one of the busiest stations on the Blue Line. Recognizing the prominence of the corner as a gateway to the Division Street retail district to the west, the coalition asked for a significant building, with a size and architectural quality equal to the landmark Home Bank & Trust Building across the street. A mixed-use development was sought to create a round-the-clock synergy among residential, retail and business uses. A high-density structure was pursued to bring more life to the Polish Triangle, more customers to adjacent retail businesses and to fully exploit the available public transit. The final policy asked for an emphasis on public transit over the automobile to promote pedestrian safety and facilitate mass-transit use. The commercial appeal of this highly visible site is clear. This was true when Pizza Hut forced itself on the community 25 years ago and has been reiterated in recent years by Walgreens' aggressive attempt to build on the site, and the sustained interest of a string of developers seeking to build freestanding drive-through banking facilities. It is simply not enough for a prominent site like this to be exploited for private gain. There must be a public benefit as well. For this reason, the community coalition dismissed these inappropriate proposals and resolved to wait for the right proposal, however long that took. In 2011, the property was purchased by developers Rob Buono and Paul Utigard. Over the past six months, they have worked closely with the alderman and community representatives to develop a scheme that is responsive to the four policies. 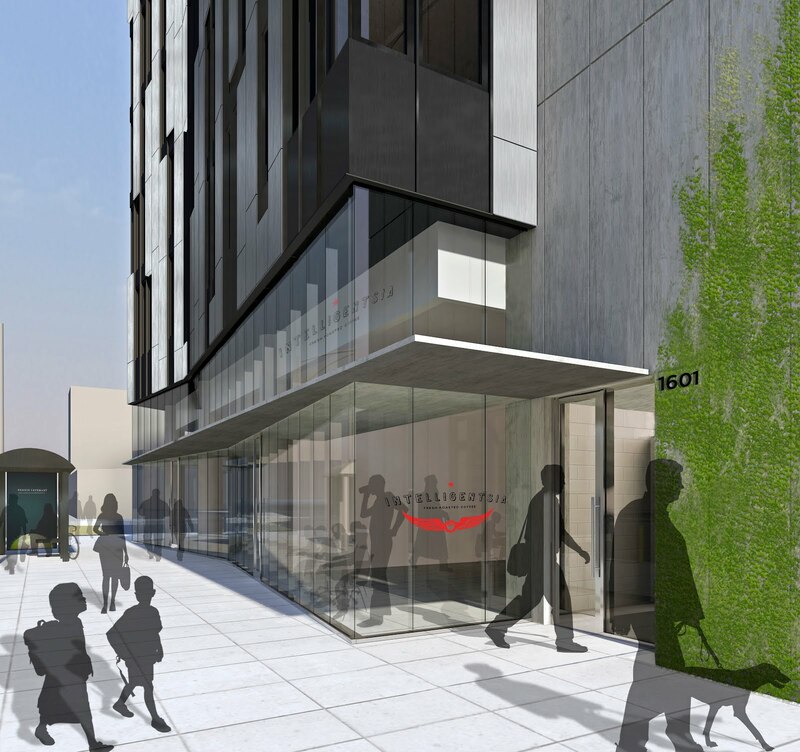 At a recent public meeting at the Near North Montessori School, they presented the latest iteration of their design, an 11-story building with ground-floor retail, second-floor offices and nine floors of rental apartments. The ground floor will be subdivided into two retail spaces fronting on Division Street, and a third onto Ashland. Intelligentsia Coffee is said to be taking the western space on Division, while PNC bank will occupy the Ashland space. The bank will have two drive-through lanes entered from the existing alley on Division Street, and exiting onto Ashland across an existing curb cut at the south corner of the site. The presence of the drive-through was controversial, and represents the only significant concession on the part of the community. Unlike other bank proposals for the site, this one added no additional curbcuts, had fewer drive-through lanes, contained additional non-bank retail on the ground floor and had commercial and residential space above. In previous meeting with the developer, community representatives raised concerns about westbound traffic on Division Street turning into the alley and noted that left turns into the existing fast food restaurant cause traffic congestion. Ald. Proco Joe Moreno suggested constructing a median on Division Street, east of Marshfield, to prevent any turns across eastbound traffic. The developer agreed to this, although funds to build the median remain to be identified. The upper floors will be accessed through a lobby at the base of a monolithic elevator tower on Division Street side, at the west edge of the site. From the rendering, it appears that the tower will obscure the view of the adjacent fast-food restaurant and signage. The west face of the tower will feature a 10-story changeable work of graphic art, described by the developers as a nonprofit version of a nearby building mural facing the expressway. A mezzanine above the rear of the retail space will provide bicycle storage for apartment tenants. The second floor of the building will contain a large office space and art studios. The developers stated that they will seek a tenant like an arts organization, though they may occupy the space themselves. The art studios will have movable partitions to allow them to be leased individually or joined into larger spaces. The upper nine floors will contain 13 units of various sizes on each floor. A green roof and terrace will be accessible to the tenants in lieu of individual apartment balconies. A significant aspect is the limited onsite parking. According to the developers, 35 parking spaces will be available, 20 of which will be on the adjacent Wendy’s property through an existing agreement. These parking spaces will not be available for residents: They will be reserved for visitors and a car sharing service like I-Go. In an earlier presentation, nearby neighbors voiced concern that if residents of the new building did have cars, they would park on Marshfield. The developers believe the building would attract residents that do not own cars. Nonetheless, they agreed to have tenants sign a disclosure acknowledging that they will not be eligible for permit parking. The concession will be incorporated into the Planned Development agreement with the city that will govern the development. East Village and Wicker Park are dense, highly livable urban communities with a long history of forward-thinking planning initiatives. Over the past two decades, residents and community organizations have worked to have trees planted on Division Street, to incorporate height limits into the zoning ordinance, to establish "pedestrian streets" that promote local retail, to enact standards that prevent townhomes from turning blank facades to the street and for preservation of the historic character of the neighborhood. Advocacy for the appropriate development of this site continues the tradition – encouraging public transit use, reinvigorating a desolate stretch of Division Street and supporting local independent businesses. This looks like a great option for this space. Any sense on when construction would be set to begin. Allowing a new building of this scale with no parking is a slap in the face to every tenant, homeowner and landlord of a historic building. Buildings with no on-site parking are nothing new in Chicago, until 1957 no buildings were required to have parking. Neighborhoods like Wicker Park where the backbone of the urban fabric are historic buildings are have never had enough parking to be considered balanced. This new building will make the problem worse. Residential street parking will be harder to find, the cost of private off=street parking will rise and so will the auto emissions coming from the cars of more people cruising neighborhood streets searching for parking. Study after study shows a rapid decline in car ownership and annual miles driven over the past decade, particularly in dense inner city neighborhoods like ours. The younger generations that increasingly populate East Village, Wicker Park & Bucktown rely less on cars than older generations and have little interest in owning them. In fact, it is the independence from car ownership offered by the walkability of the community, the availability of a variety of public transit options and the many marked/protected bikeways that draw people here. There is a clear demand in the neighborhoods surrounding the Polish Triangle for transit-oriented development. According to transitized.com, more than 50% of residents in the area use non-car transportation. 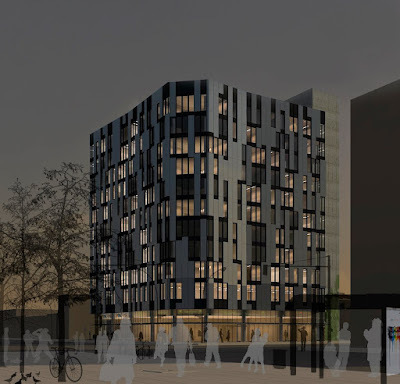 The apartments in the new building are marketed to non-car owning renters and a restrictive covenant prohibits them from obtaining parking permits for the adjacent streets. It makes no sense to require parking in a building when it is not needed, or wanted, by the residents. Cars are here to stay; some people will still choose to rely on them all the time, and many people will rely on them some of the time, but the old associations of cars with freedom, independence and 'America' is dead.